Drivers may face black ice Wednesday morning, as temperatures were expected to dip as low as 19 degrees in the Seattle area Tuesday night. The region could get another cold system with snow Friday and Saturday. Driving conditions on many busy Seattle streets had improved Tuesday, but officials warned that some roads are still icy and are looking ahead to the possibility of more snow this weekend. Downtown streets are mostly clear, and dozens of King County Metro bus routes returned to normal Tuesday, although there were still significant delays, according to King County Metro. While Metro buses got stuck 200 times Monday because of road conditions, there were only 11 cases by 4 p.m. Tuesday. However, lesser-used roads to the north, south and east were still icy, and hills remained a challenge, according to Metro. 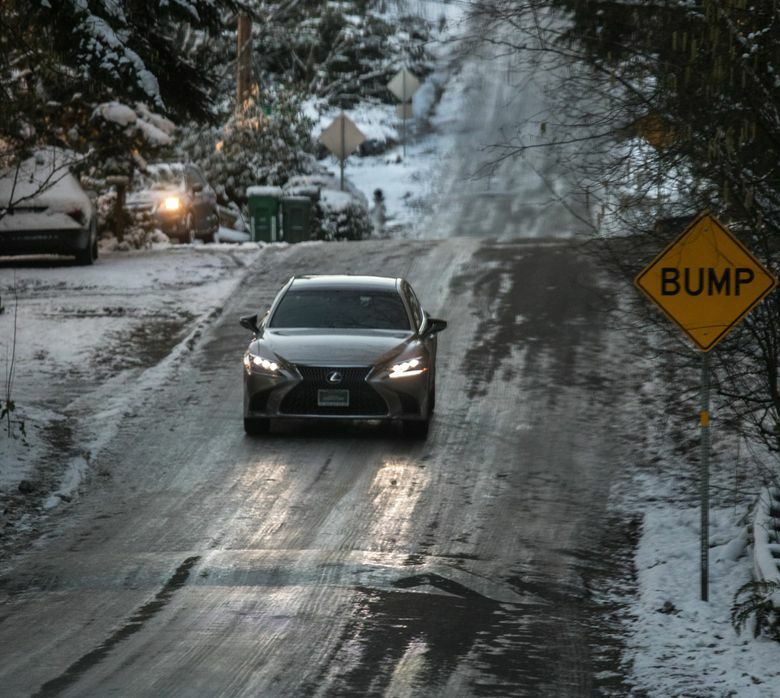 Drivers may face black ice Wednesday morning, as temperatures were expected to dip as low as 19 degrees in the Seattle area Tuesday night and refreeze moisture on the roads, according to the National Weather Service in Seattle. School districts starting late because of Wednesday’s icy conditions include Seattle, Highline, Shoreline, Renton, Federal Way and Tacoma. The University of Washington’s Seattle and Tacoma campuses have returned to normal operations, but classes are delayed on the Bothell campus. Those planning to ride Metro buses should also allow extra time for their commutes on Wednesday and check for the latest updates online, Metro spokesman Jeff Switzer said. The Seattle Department of Transportation (SDOT) has been working on roads since Sunday, first pre-treating them using a magnesium chloride substance before the snow hit. Since the flurries started, crews applied a brine mixture to major roadways multiple times to prevent icy patches and to make the snow slushy. The city’s 35 snow plows and 15 hand crews have been working to remove snow and ice from roads and sidewalks, some of which are prioritized, according to SDOT. Some pedestrians still faced slippery sidewalks Tuesday morning, even on well-used strips, such as the Denny Way Interstate 5 overpass. Photos on social media showed some pedestrians walking in the road instead of the iced-over, steep sidewalk. Crews cleared and salted the overpass by around 11 a.m., according to a tweet from Dongho Chang, the city of Seattle’s chief traffic engineer. The city’s winter response plan calls for treating all pedestrian overpasses over Interstate 5 within 24 hours of the start of a storm, and to clear sidewalks within 12 hours of a lull in the storm, SDOT spokesman Ethan Bergerson said in an email. This is also done for other pedestrian areas not adjacent to homes or businesses, which are the responsibility of property owners, Bergenson added. As city and transportation officials continue to respond to the recent snowstorm, they’re also preparing for the possibility of more snow in the region Friday and Saturday. Seattle Times Traffic Lab engagement editor Michelle Baruchman contributed to this report.